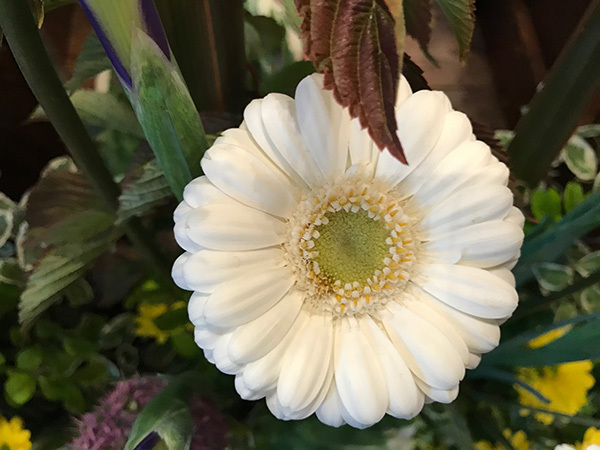 There are many places where I can find inspiration for new designs, in my garden, out in the country, browsing online, in museums, window shopping and at my local garden centre. 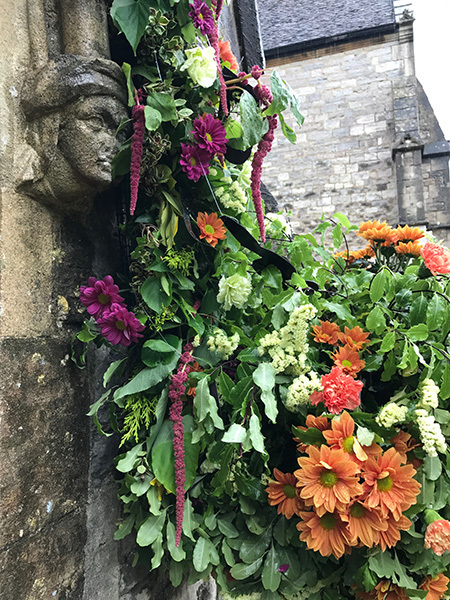 However flower shows never fail to delight and inspire me, and today I was able to visit one in my local town in the pouring rain and there was a wonderful surprise waiting for me…. 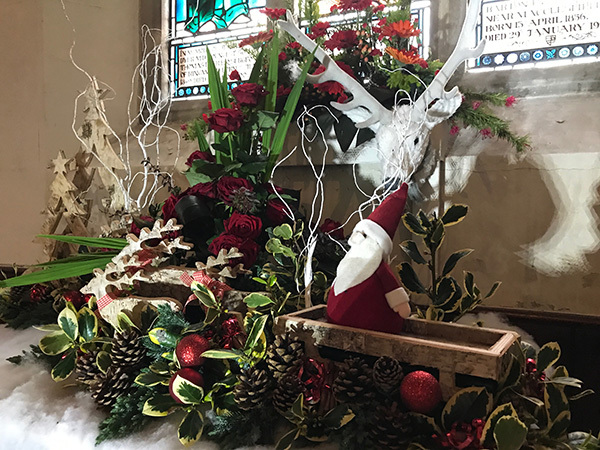 The display over the entrance to the church was spectacular. 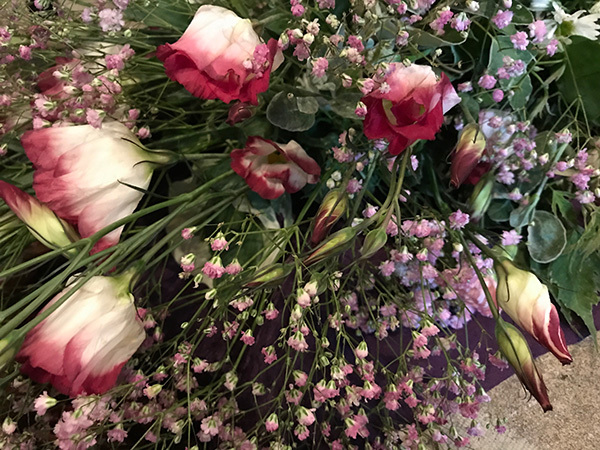 Just adore these love lies bleeding flowers! 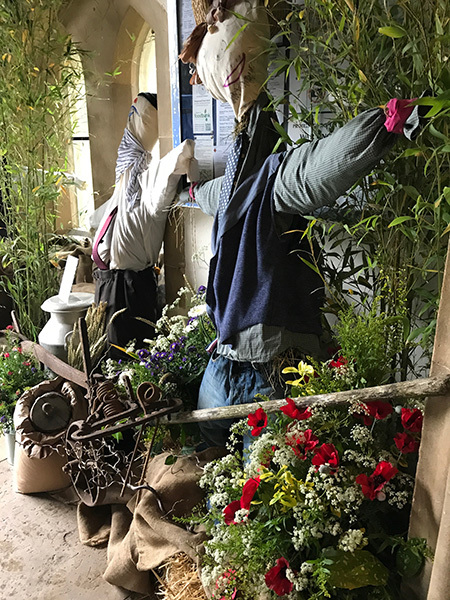 Inside the porch I was greeted by several scarecrows which form a part of local festival around Harvest. The theme of the festival was music, and many of the arrangements were inspired by musicals. 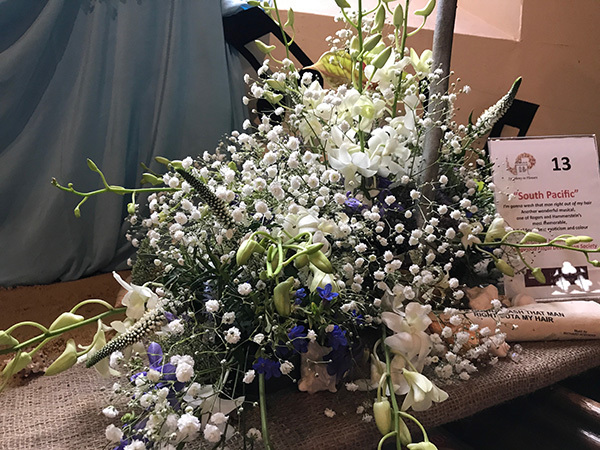 White flowers are so beautifully simple and fresh, and the display over the font was delightful. Gorgeous yellows and blues along the main aisle reflected the river valley where the church is located. Love the upright Alliums, which I have never got round to growing. Fresh white Orchids in the South Pacific display. I am currently working on digitising a collection of Orchids to be released later this year. 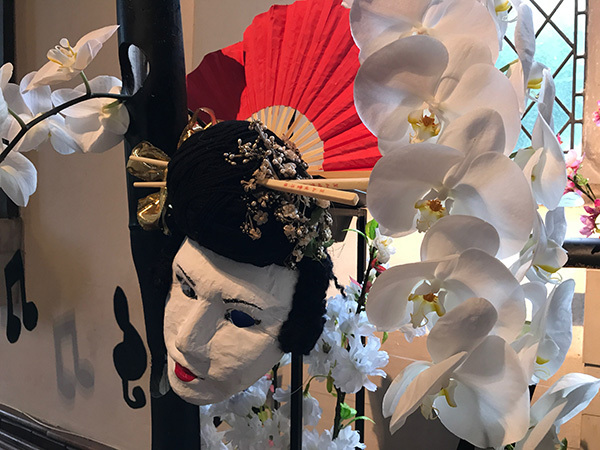 The Orchids in this display for the Mikado reminds me of Japanese Blossoms which were used to embroider a beautiful kimono for a production. 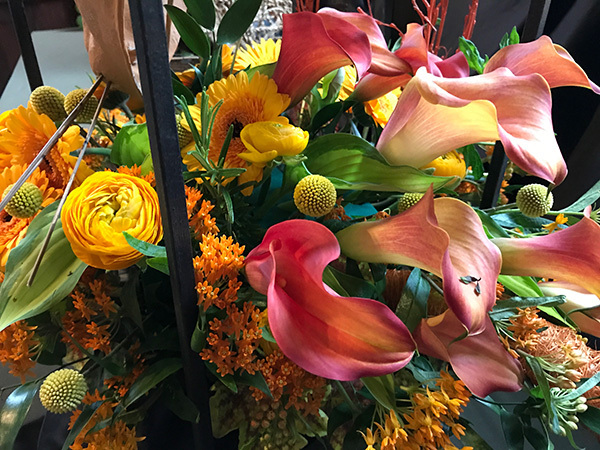 I am not aware of the name of these amazing orange flowers but I adore the shape of the petals, and must incorporate them into a future embroidery designs. If anybody knows their name please email me. How dramatic they are with the Calla lilies. The colours are exceptional and would be a huge challenge to capture in stitches. 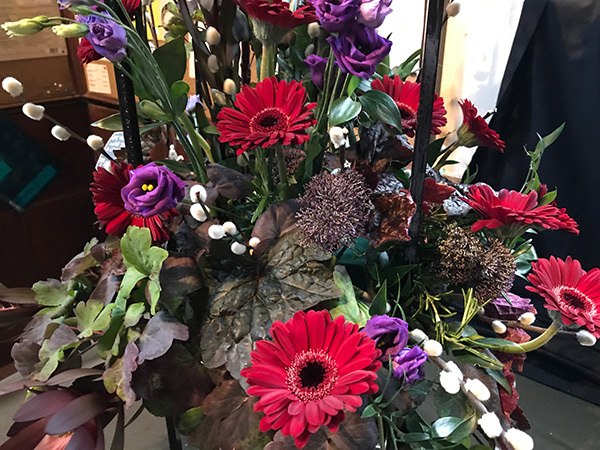 Deep purple Heuchera leaves mix well with dark Gerberas. I have never digitised purple leaves before! Gerberas feature in my Victorian Promises collection. 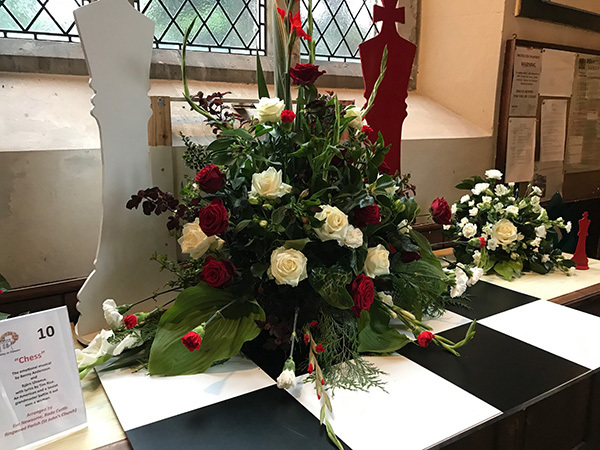 Simple red and white Roses for a Chess board. Roses are a huge challenge especially capturing their depth. 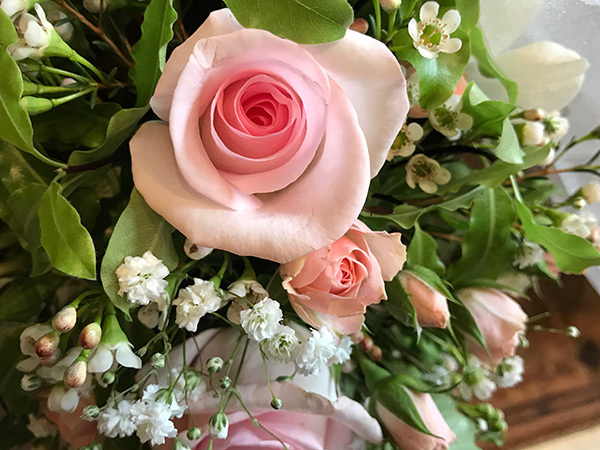 I have several collections which include roses, The Embroiderer’s Prayer, Victorian Promises and Floribunda’s Serenade. I anticipate more to come! 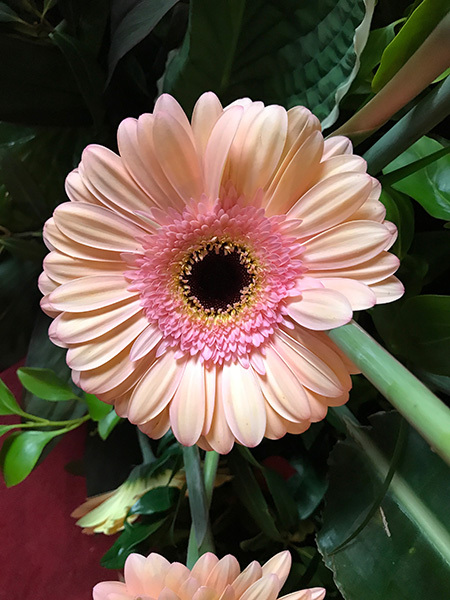 Again I am drawn to Gerberas. But which colour is my favourite? This display captures and battle of Trafalgar and the 1812 overture. 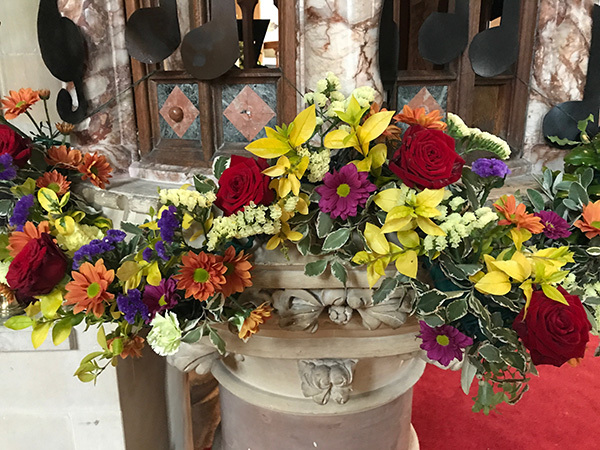 Bright colours were used for the arrangement around the pulpit perfectly matching the marble pillars. 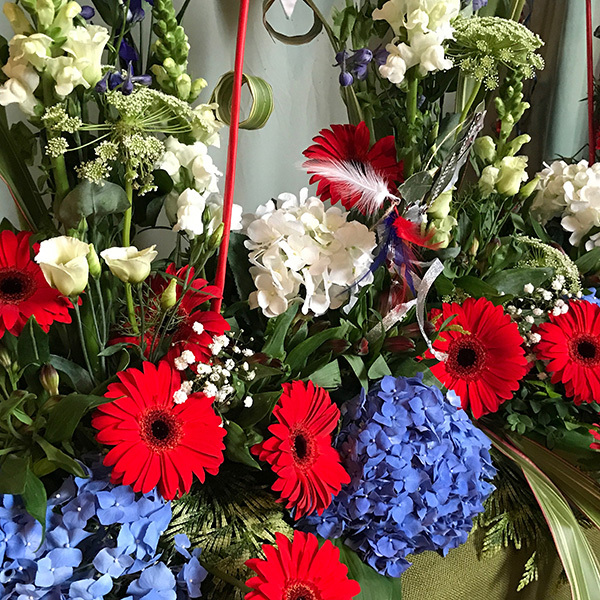 A patriotic display of red, white and blue. Looks like Ammi flowers which are similar to cow parsley which features in my new Summer Meadow collection. 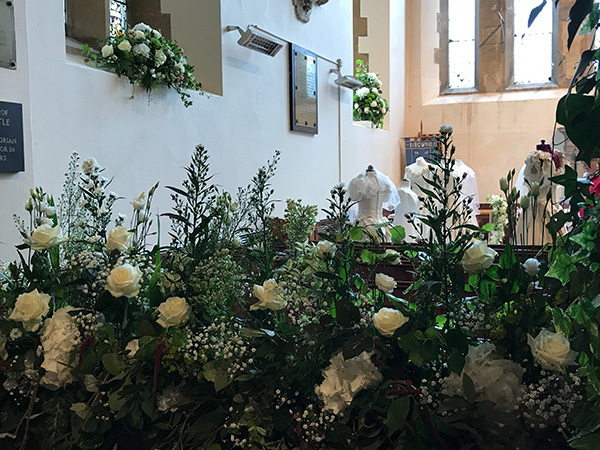 As I approached the Lady Chapel I was so excited to see a display of wedding dresses behind the wall of white flowers! 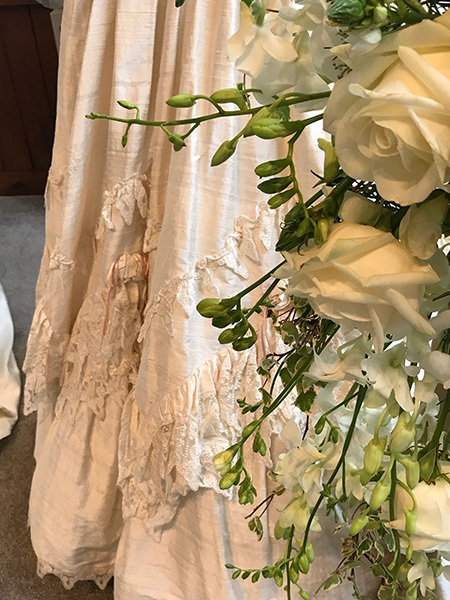 Having been a bridal dressmaker I was thrilled at seeing them. This was my favourite dress in the palest of peach silk with Nottingham lace which has a net base. Probably inspired by Lady Diana’s dress back in the 1980’s. This dress is remarkable too with very deep Nottingham lace. 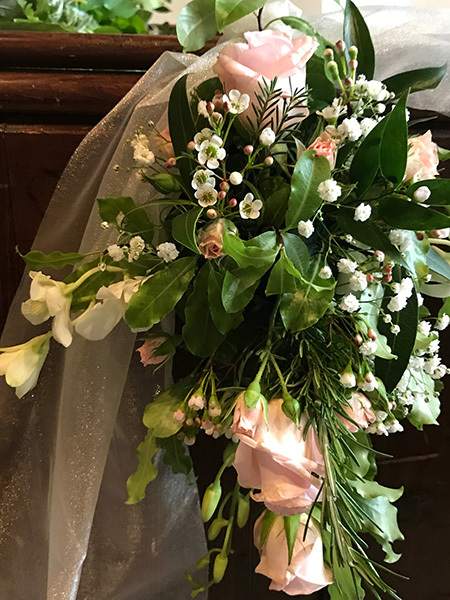 Of all the flowers in the festival this was my favourite, a perfect pink rose crying out to be digitised, hanging on a pew end. The most fascinating exhibit flowed down each side of the steps leading up to the altar. It depicted the miracle at Cana, when Jesus turned water into wine. I loved the white Lisanthus with wine coloured tips which helped the progression of colour. Very unusual. 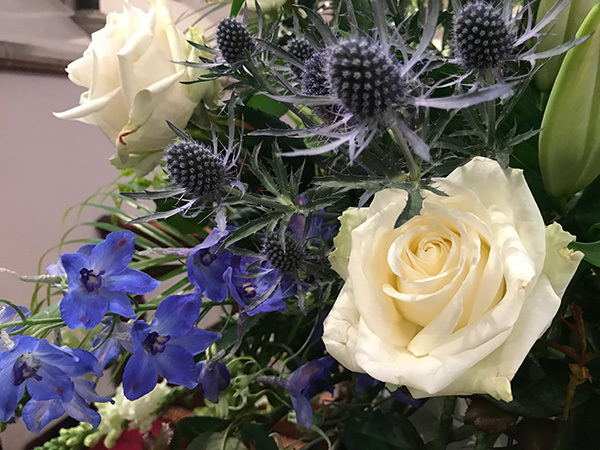 A perfect combination of colours, but I have always loved the combination of blue and white flowers which can be found in Sweet Innocence, but no Sea Holly digitised as yet! 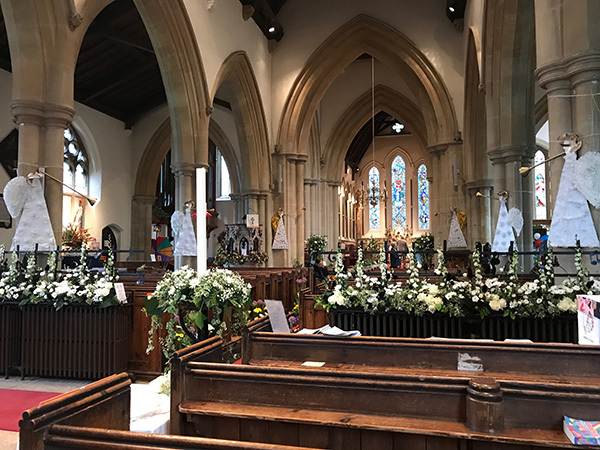 The two pedestals by the altar were beautiful. 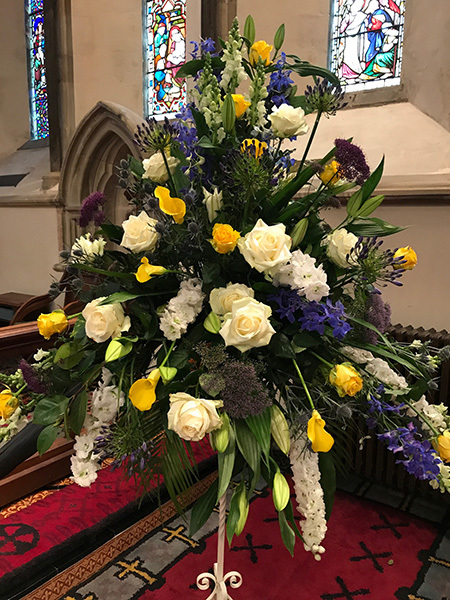 I love arranging a pedestal in my own church and was interested to see how few flowers were used for this. 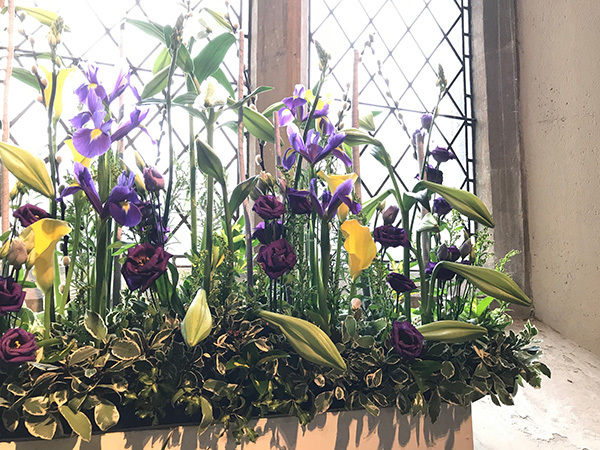 The wonderful blue and white Delphiniums in these arrangements would be very difficult to capture in embroidery – maybe one day. I was drawn to these Hebe flowers which are so pretty. Tiny flowers hold a very special place in my heart. 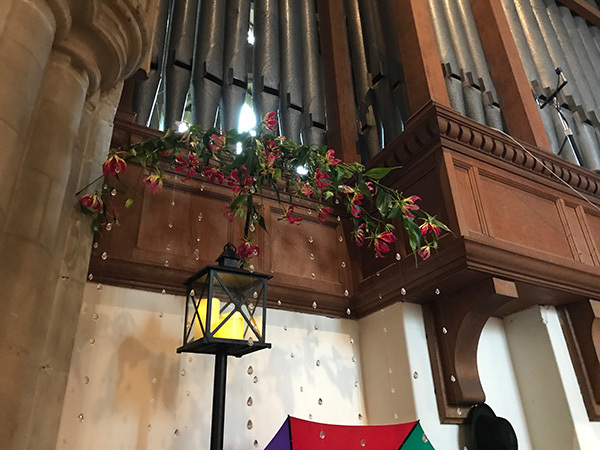 This was the Singing in the Rain arrangement placed by the organ, which was very clever, with flame lilies. Getting in on camera was difficult but you get the idea. 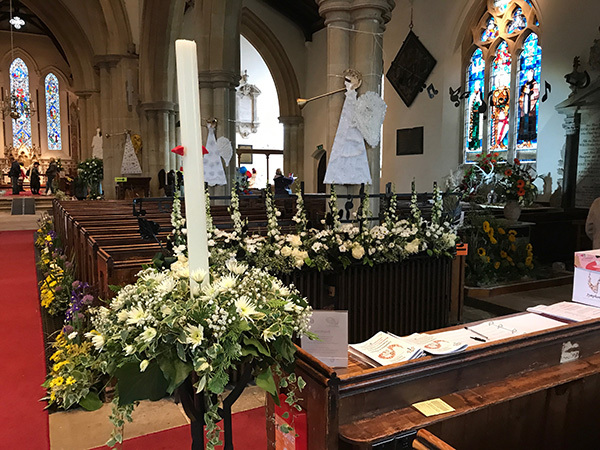 Christmas and Easter were also featured as musical festivals. What an absolute joy the Festival was. I shall return in a few days when more of the lilies and irises are in flower. The ladies of the area have excelled themselves and will no doubt give much joy to many over the next few days. 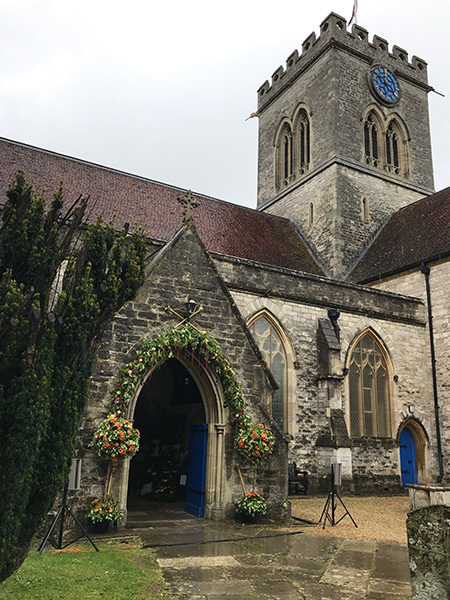 I hope you have enjoyed my inspirational visit to Ringwood Parish Church. Now to put some of those colour schemes and flowers into embroidery. 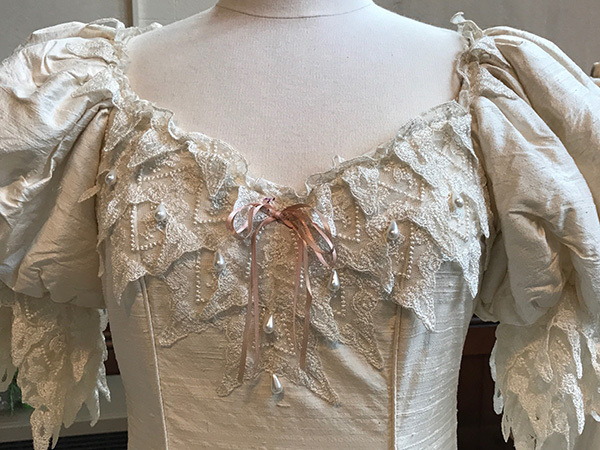 This entry was posted in Discussing machine embroidery, Inspirational and tagged development of embroidery, Exhibitions, The importance of colour. Bookmark the permalink. WOW! Just beautiful displays! But, oh….that dress! Thank you for sharing! Thank you, thank you for sharing these breath taking photos. I love flowers and am a gardener. The gowns were exquisite also. Thank you for sharing those gorgeous pictures. Simply beautiful! Thanks for sharing! 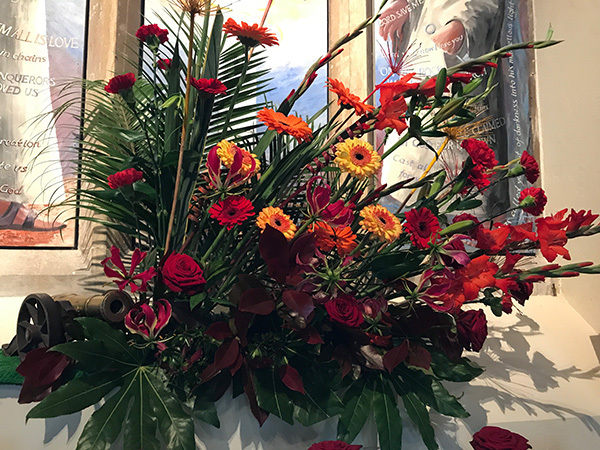 Those arrangements were breathtakingly beautiful! 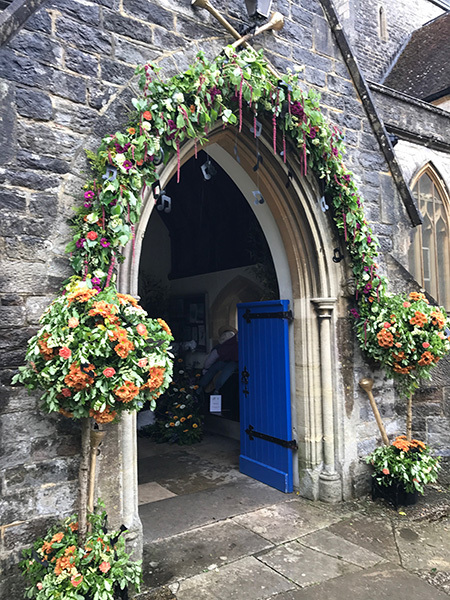 I loved the orange and purple together with white around the archway of the entrance! 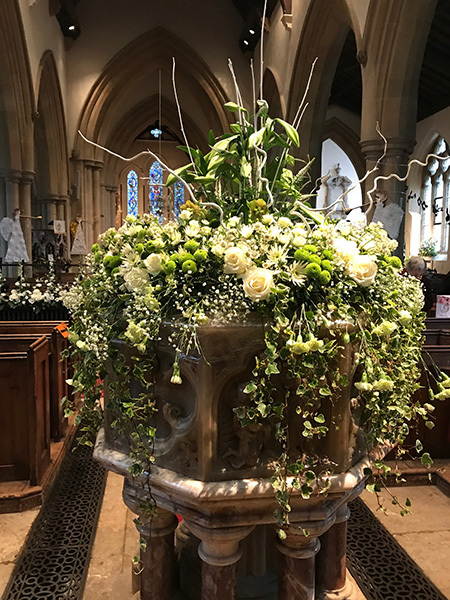 Wow, absolutely amazing floral displays! Really beautiful and a beautiful dress as well. What was this for? I guess I can’t find that piece of information. 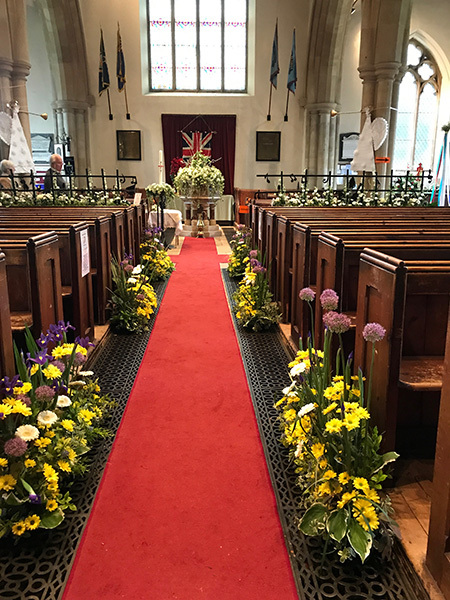 Just a local flower festival celebrating floristry. Loved seeing these pictures! 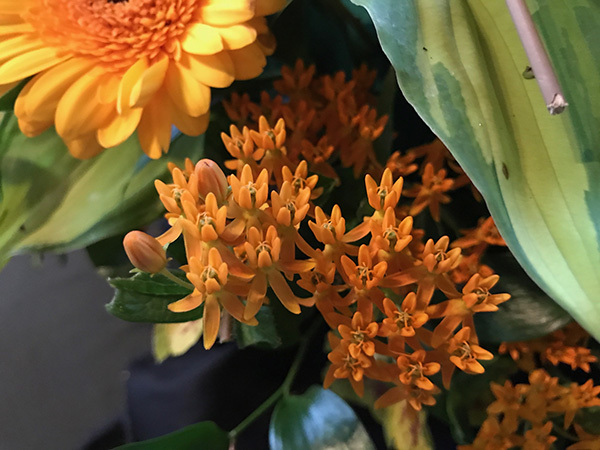 in the US, the little orange flowers are called “Butterfly Weed” Latin name “Asclepias” Orange is the most common colour but they also appear in white, pink and yellow. Wonderful. I hate not knowing the name of a plant. 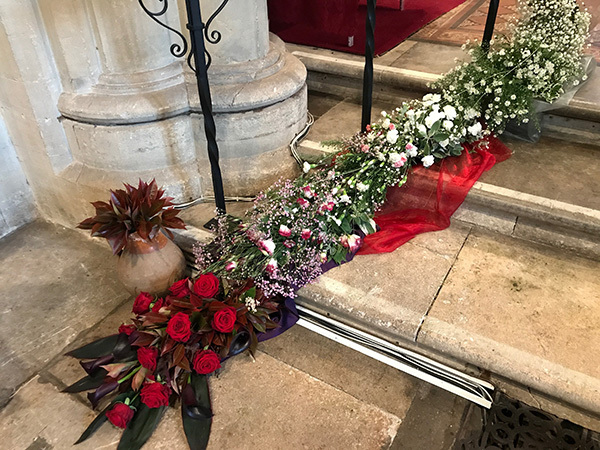 Thank you so much for sharing the wonderful pictures of a church decorated with flowers. It is absolutely stunning and no wonder that you were surprised. OH how I wish I was there in person to see this wonderful site. Thank you for sharing. This is absolutely beautiful. 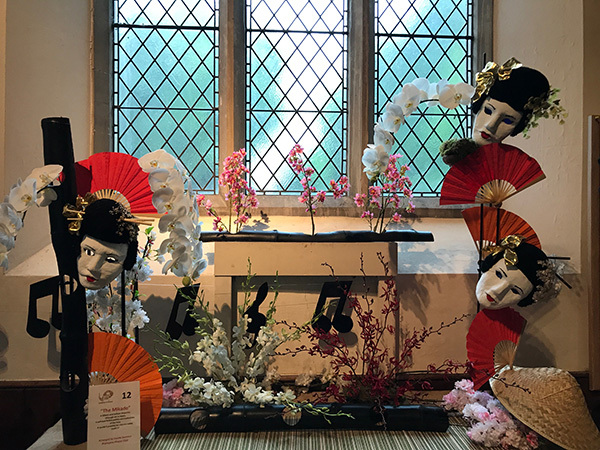 What a fantastic flower show. 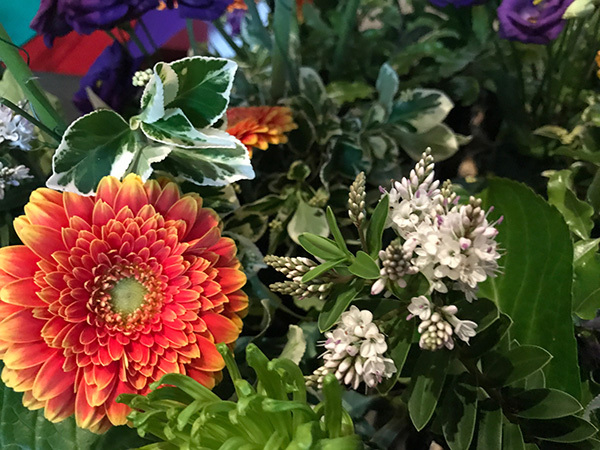 There are some very talented people behind these lovely blooms. Thank, Hazel for sharing the photos. Here in Colorado we are getting a late spring snow so getting to see such blooms was a treat! Oh my goodness, such beauty! I could not pick my favorite as they are all beautiful. Those ladies out did themselves. Just stunning!! !